Looking for a festive way to spend time with the kids this 4th of July while sneaking in school skills for summer? Check out these fun, educational activities that will keep the whole family laughing and learning together this independence day! Note: All activities can be modified for different age groups. I worked with a toddler, kindergartner, and second grader. I tried to keep it simple with mostly common, inexpensive household ingredients. Please leave me a comment at the end of this post with a question or suggestion! The Prep: You’ll need butcher paper, tape, bubbles, bubble wands, red and blue food coloring, and cups. Mix the bubble liquid and food coloring in cups before hand to avoid extra messes. The Activity: Tape large pieces of butcher paper to a wall or fence outside. Have children write, copy, or trace a 4th of July greeting on their paper and write their names. Then, have them blow red and blue bubbles at the paper creating a pretty fireworks effect! The Skills: This can be added practice for developing writers and you can throw in some history behind the 4th of July for older students. As the children blow bubbles, you can talk about art skills like spacing and color blending or you could just allow them to get their creative juices flowing! The Prep: You’ll need baking soda, vinegar, red and blue food coloring, dishes, trays, or baking sheets with a lip, small containers or bowls, and medicine droppers. Set up a tray with a thin layer of baking soda for each participant. Pour vinegar into small bowls and then color the vinegar with red and blue food coloring. Make sure that each child has a red and blue vinegar bowl, a baking soda tray, and a medicine dropper. The Activity: When the vinegar is combined with the baking soda, it will create a fizzing chemical reaction. Start by trying to create a fizzy flag or other 4th of July themed creation. Then let them experiment with the reactants. Have a few paper bags handy so that you can dump out the trays and sprinkle a fresh layer of baking soda if kids want to start over periodically. The Skills: Your junior scientists can talk about the reaction, hypothesize, and experiment! If you have safety glasses around the house, they could definitely add another layer of fun. The artist can work on a beautiful flag and the mathematician can double check the number of stripes on the flag. Activity 3: Cookies to Share! The Prep: You’ll need a recipe for cookies and all of the ingredients. Baking is not my strong suit, so I just used the recipe on the chocolate chip bag. I’d go for cookies from scratch to get all the fun out of the experience. I suggest writing the recipe in large letters on a piece of paper with check off boxes. This way, the kids can go through and check off the list to make sure that they are following all of the directions. The recipe I used called for: 2 1/4 cup flour, 1 tsp baking soda, 1 tsp salt, 1 cup butter, 3/4 cup sugar, 3/4 cup brown sugar, 1 tsp vanilla, 2 eggs, 1 package chocolate chips. Combine the flour, baking soda, and salt in a bowl. Mix butter, sugar, brown sugar and vanilla until smooth (credit veronica www.dresshead.com). Slowly mix in eggs and flour mixture. Fold in chocolate chips. Spoon cookies onto a greased cookie sheet and bake at 375 for 9-11 minutes. The Activity: Make the cookies according to your recipe taking turns putting in ingredients and checking off the list. Don’t forget to share them with pride at your 4th of July barbecue! 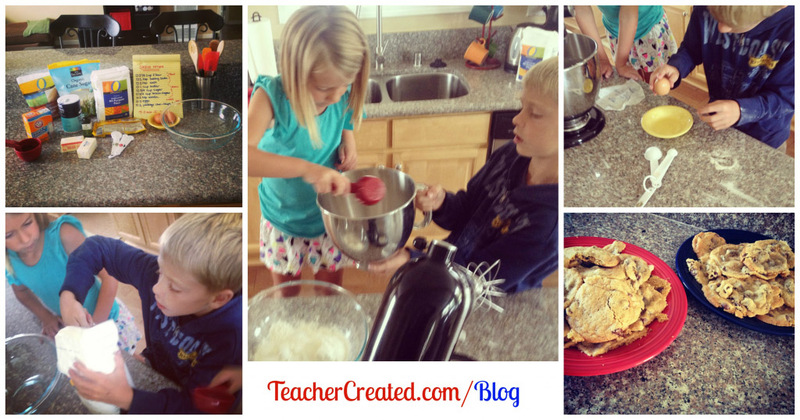 The Skills: Making any recipe together builds teamwork and math skills. Be sure to point out how the measuring cups work and the importance of following all of the directions. You could modify this activity with any recipe you want and ramp up the complexity for older kids or find a healthier alternative to discuss nutrition. What do you think about these festive 4th of July activities? Please share your comments, questions, or suggestions! Emily Guthrie has taught junior high and high school English in Southern California for 8 years. She currently teaches grades 9-12, including AP English Language and Composition. 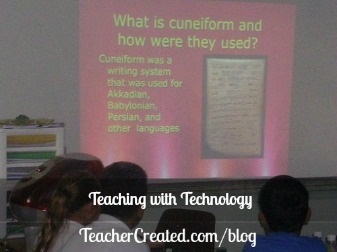 She specializes in working with technology to enhance curriculum for English learners and enrichment students. She also blogs about fitness and motherhood at TheBusyMomsDiet.com. It is hard to believe, but it’s already May! Report cards will be due soon, promotion ceremonies must be planned and end of the year testing is upon us. So what is a teacher supposed to do when the only thing greater than the looming to do list is the students’ desire to be on summer vacation? Here are some tips to keep students engaged in curriculum without adding too much to our already overextended schedules. There are so many awesome online resources available that can easily be aligned to our curriculum and common core standards. Prezi or PowerPoint: Students can create presentations covering any subject they’re learning! Creating and delivering presentations is an important language arts skill for students to learn and it can do double duty if they are presenting information related to science, history, literature, or other content areas. In my experience, upper grade students love to create cool presentations and the accountability of presenting to their peers spurs them on to do their very best work. Note: Prezi is a little more complicated and requires an email address to sign up, so it is most appropriate to use with older students who are highly computer proficient. I suggest you make some teacher prezis for lessons before you teach students to make them. PowerPoint may be the best option for starting out this kind of project. Starfall: This is a great resource for lower grade students. There are a variety of phonics and literacy resources for students to work at their own level. Arcademic Skill Builders: This website is dedicated to engaging and exciting K-8 students in math, literacy, geography, and more all in a safe environment! You can use this site for free, but if you sign up for the subscription, you can customize game content, track student achievement, and help students earn awards for performance. Looking for more ways to incorporate computer projects into your classroom? Check out Teacher Created Resources Computer Projects for Grades 2-4 and Computer Projects for Grades 5-6. Leave us a comment and share your favorite online resources for students. Tip: Be sure to research the site, understand how it works, and check to make sure it won’t be blocked from your school’s internet filter before you take your class to the lab. We all know that many kids learn best from active, hands-on activities, but we don’t always have the budget or time to create elaborate, new kinesthetic activities. Worry not, my fellow tired teacher, I recently attended a Kagan Cooperative Learning seminar where I picked up fun strategies for getting students up and moving that can be used across subjects and grade levels. These are definitely easy and fun tools to keep in your pedagogical toolbox! Quiz-Quiz Trade: Students make flashcards (or are provided with flashcards) for academic vocabulary or facts that you are learning in class. Each student needs to have a set of flashcards that match everyone else’s set, but shuffled up in different orders. Then, everyone stands up and picks a partner. It is best if you have a big open space in the classroom or outside. I love to take my class out to the field next to my classroom on a beautiful spring day. Partner 1 quizzes partner 2 on just one flashcard, and partner 2 is praised or coached by partner 1. Next, they switch and Partner 2 quizzes partner 1 on one flashcard with praise or coaching. Once both have had a chance to ask and answer one card, they trade the used cards and find new partners. The whole class continues to mingle for an allotted amount of time quizzing, quizzing, trading, and finding new partners. I love this activity because it gets students’ blood flowing while also developing vocabulary and study skills! It can work in almost any subject. 4 Corners: The teacher asks students to stand in the middle of the room and then announces “corners” and a question with four possible answers. For example, the teacher says that the four corners of the room represent 4 characters from Charlotte’s Web: Charlotte, Wilber, Templeton, and Fern. Then, the teacher asks, “Which character from the book can you relate to most?” After a short “think time”, students go to the corner labeled with the character that they can relate with most. Once there, they must find a partner and discuss their reasoning (credit veronica http://www.dresshead.com). Later, students can write about this topic with a plethora of ideas gleaned from their own thinking and discussions with others. Stand up, Hand up, Pair up: When reinforcing concepts and continuing to develop academic vocabulary, it is helpful for students to have a chance to discuss their ideas, but all too often I find the same hands raised and the same students dominating the conversation. To get everyone in the class talking, try asking students to walk around the room shaking hands and greeting their classmates. This helps mix up the usual friend-partners and work on social skills. After a minute or so, tell everyone to stand with their hand in the air and high five one person near them. The high five partners turn into discussion partners. Once the partners are picked, the teacher asks a question and each partner has an allotted amount of time to answer. After both have answered, students sit down and the teacher calls on a few students to re-tell partner’s answers. This gives all students a chance to speak, listen, and participate actively. 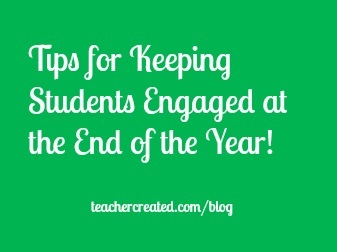 Check out more Teacher Created Resources Creative Classroom Ideas! I especially love the hands-on projects found in each section of the literature guides, like this one about the novel Holes. 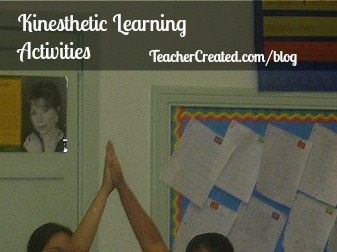 What are your favorite kinesthetic learning strategies? Leave us a comment and share the love! Emily Guthrie has taught English Language Arts in grades 6-12 for the last 7 years. She lives with her husband, Chris and toddler Miles in sunny Southern California. Emily loves creating curriculum, cooking, running, and blogging.